Penn State University Press, 9780271016047, 348pp. When Eduard Shevardnadze resigned as foreign minister of the Soviet Union in 1990, he ended one of the most remarkable and controversial political partnerships in modern history. Together with Mikhail Gorbachev and Alexander Yakovlev, Shevardnadze led the dramatic Soviet about-face in the 1980s that ended the Cold War and transformed the international political climate. While Gorbachev and Yakovlev focused on domestic reform, Shevardnadze redirected foreign policy. His willingness to act decisively made him the "moral force" of new thinking and the point man for the policies of perestroika. 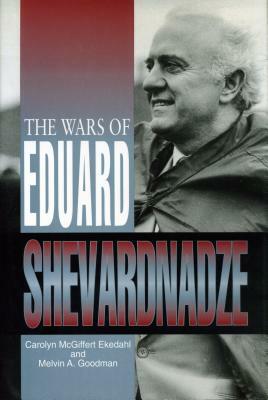 This major book is the first to take a critical look at the many battles Shevardnadze has fought at home and abroad throughout his remarkable career. Carolyn Ekedahl and Melvin Goodman--veteran observers of the Soviet system--describe and analyze Shevardnadze's career, beginning with his Georgian past. They assess his responsibility for the Soviet collapse and the leadership role he continues to play in the independent state of Georgia. While sympathetic to what he has achieved, the authors show how Shevardnadze was a product of the Soviet system he sought to change but would help to destroy. He has proven a skillful politician who exploited available instruments of power to advance his career and further his policy objectives. For this book, the authors have interviewed many high-ranking American, Georgian, Russian, and Soviet officials, including Shevardnadze himself and former secretaries of state George Shultz and James Baker. Both Shultz and Baker credit Shevardnadze with convincing them that Moscow was committed to serious negotiations. They conclude that history would have been far different if it were not for the personal diplomacy of Shevardnadze. Carolyn M. Ekedahl is Chief of Public Communications on the Public Affairs Staff at the CIA. She is the author of Moscow's Third World Policy under Gorbachev (1990).Melvin A. Goodman is Professor of International Security Studies at the National War College. His books include The End of Superpower Conflict in the Third World (1992) and Gorbachev's Retreat: The Third World (1991).